There’s something special in the air, and it features the fresh aroma of burnt rubber, spent high-octane fumes, and a faint waft of highbrow entitlement. 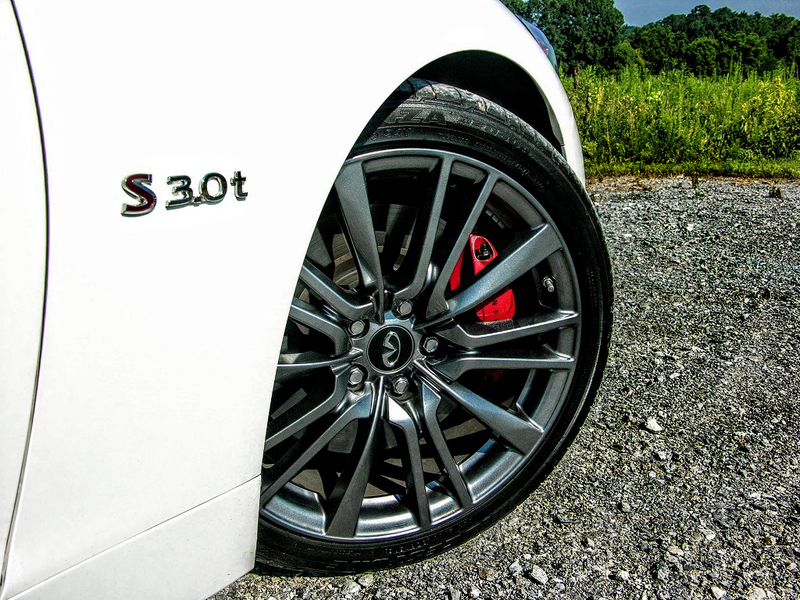 For years, Infiniti has struggled to reconnect with luxury car buyers, and that time has officially come to a close. 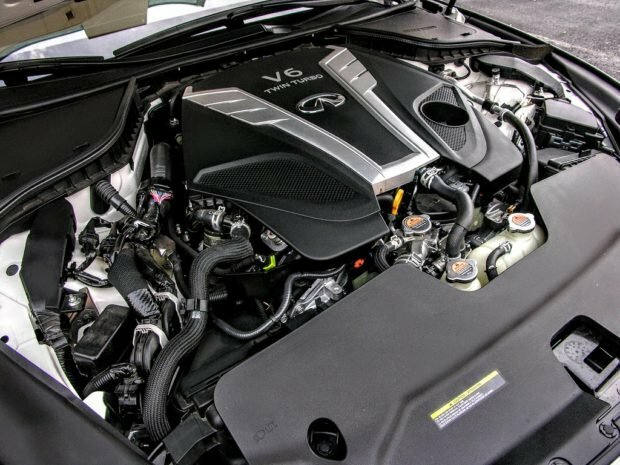 It all began to change back in 2016, when the twin-turbo VR-coded V6 made its debut in the Q50 sport sedan and the brilliantly styled Q60 coupe. From there, Infiniti went on to sweep-up a Wards Auto award for best engine, in the process reigniting brand interest with enthusiasts, the likes of which has not been seen since the G37 took its final bow. Sales have been pretty brisk too, with 2016 being the best year in company history for the Nissan off-shoot, with Q50 purchases leading the pack by a healthy margin. Now in its 2018 model year, the mid-cycle refreshed sedan is set to refocus its attack on the rest of the segment with a myriad of tweaks that add nothing but value, appeal, and practicality to the already outstanding sports sedan. In order to get a better grasp of what Infiniti is up to, I ventured down to Nashville, Tennessee for some back-road romps in the 400 horsepower Red Sport 400 edition and to gather some specs on what the rest of the Q50 lineup looks like. What I found out was that not only does Infiniti have the upper hand for the first time in forever, but its bestseller boasts ten outstanding reasons why it should be crowned king of the luxury sedan segment. The Q50 completely decapitates its competition when in Red Sport 400 form, boasting more power and cornering prowess than you can shake a piston at. This extreme variant of the 3.0t packs more boost in order to top 400 horsepower at 6,400 rpm (the most standard horsepower out of any non-specialty model), with torque generating 350 pound-feet of twist all the way from 1,600-5,200 rpm. But brute force isn’t this sedan’s only strength. Adaptive dampers and steering inputs team-up with downshifts that are recalibrated around computer-based terrain readings in order to produce some of the most acutely calculated cornering in the segment. Red Sport models also get a tuned dual exhaust, a paint matched diffuser, high-gloss black paint, 19-inch staggered alloys, and razor sharp multi-piston big brakes, with real carbon fiber mirrors, and a flushmount spoiler available for an additional $1,500. While the aforementioned adaptive dampers and terrain-responsive transmission shifts are impressive, it’s the second-generation of Infiniti’s Direct Adaptive Steering system that may make the strongest impression. While driving in Normal Mode at slower speeds does provide turns that can be attempted with two fingers, in Sport and Sport+ Mode, the firmness one finds is almost that of a finely tuned hydraulic system. Buyers can also personalize the steering system to meet their specific needs, in the process activating 1,000 steering adjustments per second while eliminating steering vibrations and harshness. There is also a snow mode switch for slicing through slush, with Normal, Eco, Sport, and Sport+ settings sitting atop, all of which deliver notable recalibrations in steering, throttle, traction, and suspension feedback. These setups reportedly work in harmony with an armada of computers that learn one’s driving patterns in order to tailor-make everything to taste. 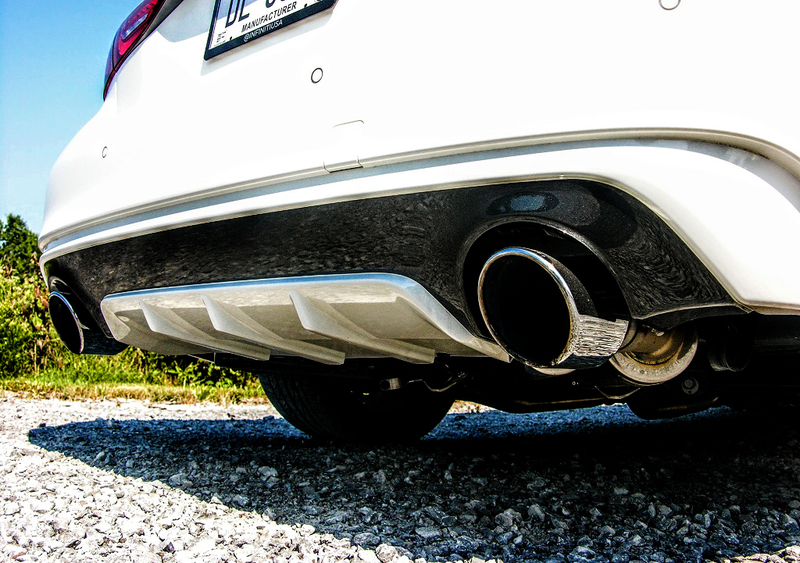 Another interesting surprise was that despite having a split canister high performance exhaust on our Pure White chariot, it was almost impossible to auditorily distinguish the difference between it and the normal exhaust. However, this conundrum was quickly dashed by the cackling roar of another sport exhaust-equipped Q50, as it blasted past us with both exhaust tips trumpeting wildly. Apparently Infiniti has done such a stellar job of embedding noise cancellation goodies within the car, that if you are inside with the windows up you won’t hear a damn thing, a fantastic problem to have in such an elite segment. Another nice note is that all 2018 Q50 powertrains come attached to a seven-speed automatic gearbox, complete with manual shifting capabilities and steering wheel-mounted magnesium paddles on Sport and Red Sport models. This acutely tuned gearbox provides a snappy, silent, and super smooth shift experience that adapts to your driving style and mode selected in order to keep things both calm and acute. As with all luxury sedan marquees, the new 2018 Q50 plays host to a wide array of options, and with both revamped interior and exterior touches making their mark, it’s a guaranteed win for buyers regardless of what trim level they choose. Speaking of which, this mid-cycle refresh comes with a new grade structure, and buyers can now choose Pure, Luxe, Sport, or Red Sport 400 models, with each grade offering both unique aesthetic and functional touches. 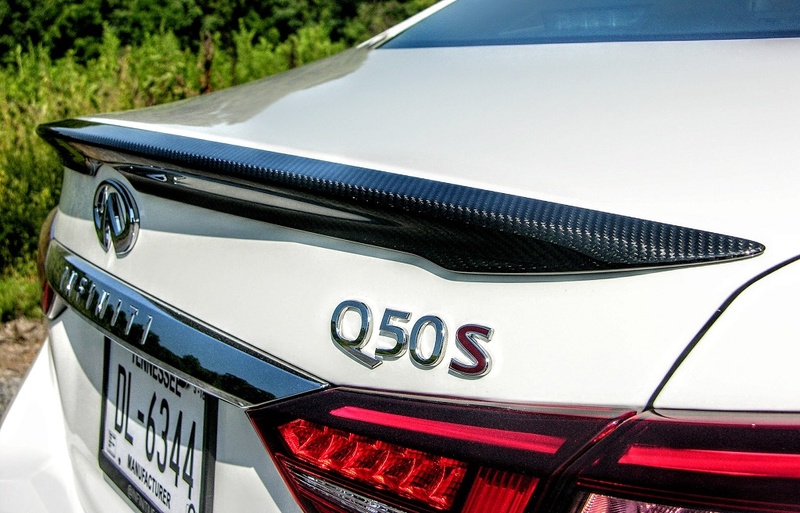 Infiniti has long harbored an approach to aerodynamics that involves “zero lift,” and in keeping with this mantra, the new Q50 packs an undertray beneath the front bumper that completely eliminates lift front to rear. Both Sport and Red Sport 400 models take things even further with uniquely shaped bumpers and larger air ducts for better cooling and a total drag coefficient of just 0.26. Sleekly drawn, and tightly packaged, all grades feature a new double-arch grille (complete with enhanced multi-dimensional inlays), signature LED lighting both front and rear, and rear lenses that have been borrowed from the Q60 sports coupe. 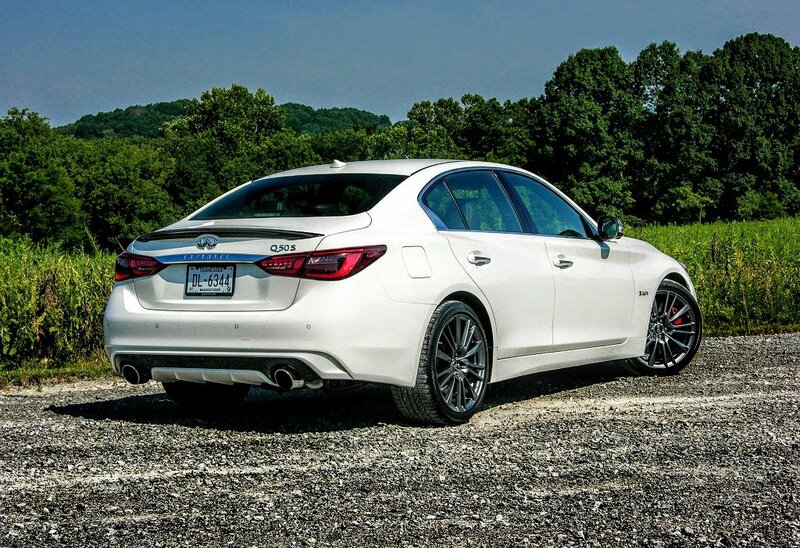 Once outfitted with a body-matched rear diffuser and a carbon decklid spoiler, the Q50 morphs into a squat, strongly drawn sport sedan that cuts through the elements just as sharply as it looks while standing still. Continuing with the Q60 borrowing spree, Infiniti’s designers have turned the Q50’s already brilliant cabin into a performance and luxury-packed play pen. Everything from a uniquely formed steering wheel and a leather-bound gear selector, to magnesium, wheel-mounted shifters and grippy aluminum pedals are there for one reason: Driver enjoyment. But the 2018 Q50 isn’t just about agility and drive. Those signature spinal support-focused seats have been meticulously engineered to provide both support and suppleness to occupants’ lower and upper back muscles. This may sound like small enchiladas to some, but no one enjoys driver fatigue or uncomfortable seats, thus making the Q50 an ideal road trip sedan. Another nice touch worth mentioning is Infiniti’s “double wave” center stack and control layout, which permits easy access and viewing without forcing the driver to change position. There also are toggle options for various driver preferences, so regardless of whether you prefer tactile switches, touchscreens, a command knob, or steering wheel controls, the new Q50 has you covered. 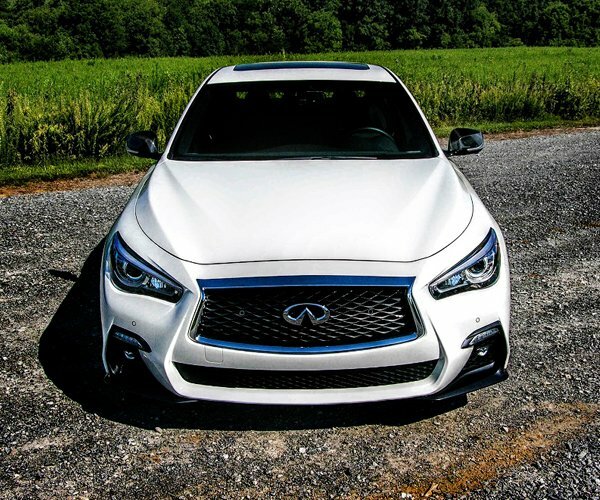 While the majority of our time with the Q50 Red Sport 400 was on winding rural roads, interstate time with the available safety systems allowed the car to give us a taste of what Infiniti’s autonomous future looks like. Although things like the Around View Monitor with Moving Object Detection and Backup Collision Intervention are more focused on preventing parking lot mishaps, it was the high-speed stuff that truly impressed. 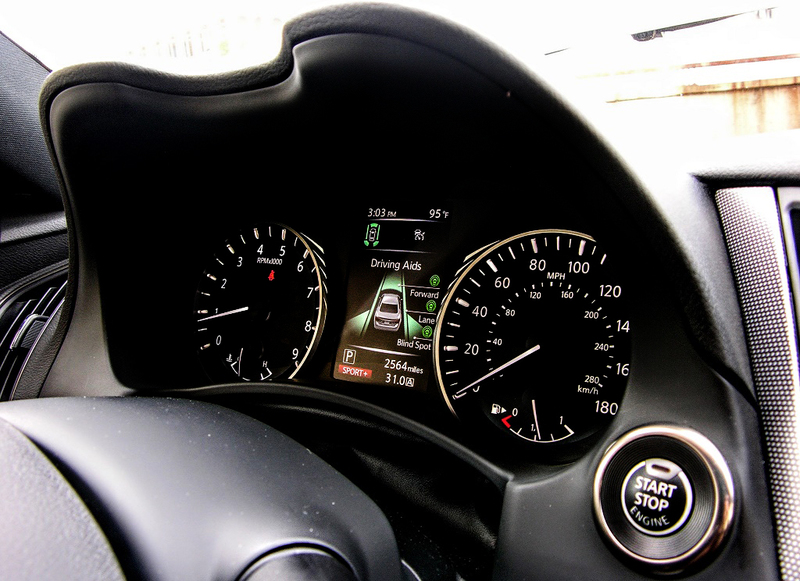 With Full Speed Intelligent Cruise Control engaged, interstate cruising was a hands-free breeze, if all but for short segments. Naturally, this system only works properly when coupled with Forward Emergency Braking, Distance Control Assist, Blind Spot Warnings, Blind Spot Intervention, Lane Departure Warnings, Lane Departure Prevention (with Active Lane Control), and Predictive Forward Collision Warning. So spend the $2,700 and get the Proactive Package, because it’s well worth the additional expense. We could go on for days about the level of detail Infiniti has put into making the cabin of the Q50 shine, but for the sake of time here are a few highlights that we liked the most, starting with all those genuine wood trim pieces. Long gone are the days of high gloss, wooden veneers of yesteryear, and in their place reside slabs of porous, grain-rich maple in subtle colors that match with the Q50’s Wheat, Graphite, and Stone interiors. Infiniti has also gone the extra mile and instilled a “Kacchu” design element within the Q50, a language that takes aluminum touches inspired by traditional Samurai garb, and fuses them with the aforementioned wood and chrome accents. This turns every Q50 cabin into a rolling homage to 16th century Urushi painting techniques, in the process creating an interior that is equal parts well built and beautiful. Our Q50 featured two touch-capacitive color screens (8-inch upper and 7-inch lower), and once attached to Infiniti’s InTouch Services makes for an extremely engaging and useful command center. 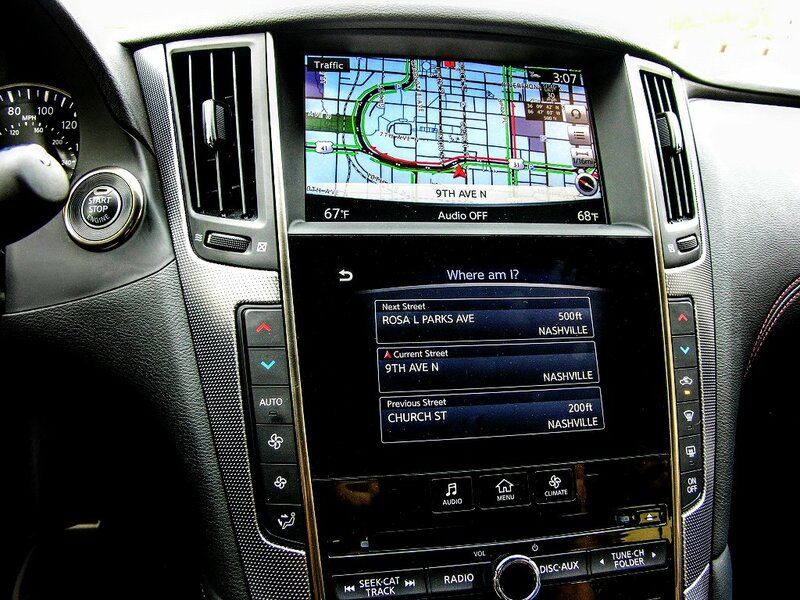 This gives drivers the ability to personalize their interior to taste, and being that the system can store multiple profiles for various drivers, reconfiguration is as simple as approaching the car with an”I-key” fob. Since your personal profile comes ingrained within the I-key, the car will automatically position the driver’s seat and steering wheel, as well as a slew of other preferred driver options before you ever engage the engine. There’s also now four years of standard complimentary SiriusXM Travel Link access on board (as opposed to the previous 6-month trial), so weather, fuel prices, stocks, sports, movie times, and more are on deck free of charge from the get-go. The Q50 can also be outfitted with a 16-speaker, Bose Performance Series sound system, which comes as part of the $2,650 Sensory Package. It’s a sharp audio experience that utilizes Bose’s latest CenterPoint 2.0 software in order to create a surround-sound experience that is equal parts potent and precise. 10. Holy affordable sedan sensationalism! But perhaps the best thing about the 2018 Q50 is its revised pricing strategy, which is palatable in lower trim and outstandingly affordable in Red Sport form. The most basic, turbo 2.0-liter Q50 Pure starts at just $34,200, before jumping to $36,550 for the Luxe version with the same powertrain, while volume-focused 3.0-liter turbo models hit price points anywhere between $38,950 and $40,650. As for the 400 horsepower Red Sport and Hybrid model, they begin at $51,000 and $50,600 respectively, with all-wheel drive versions of the entire line raising sticker prices by a reasonable two grand. 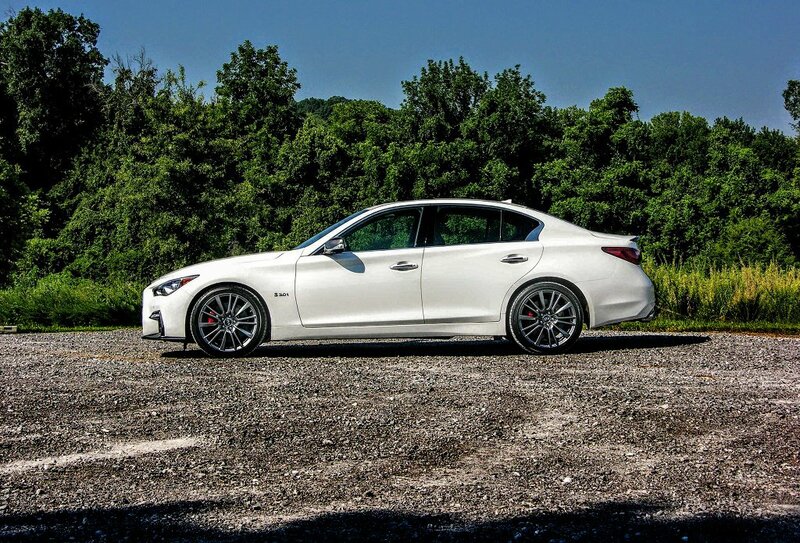 All told, this means that the refreshed Infiniti Q50 boasts both an obtainable and athletic approach to the luxury sedan market, and in Red Sport 400 form it easily bests the competition.